The Grenada Village community hall is situated in the children's play area in Mandeville Crescent. The hall is modern and includes full kitchen facilities. The hall is managed and administered by the Grenada Village Community Association Inc (GVCA) and is available for hire to residents of Grenada Village for a variety of activities. Prime use of the hall by residents is for children's birthday parties, playgroup, family gatherings, meetings, dance and music lessons, craft groups, church groups, children's Christmas parties, and personal practice sessions. The income the GVCA receive from the hall covers the annual lease to Wellington City Council, insurance, electricity, gas heating, hall provisions and specific maintenance. Any additional funds received contribute to the running of the GVCA. The two fully enclosed sealed tennis courts adjoin the community hall and are available to current financial members of the Community Association. These are not general public courts and are locked to prevent them from being misused, particularly by those from outside the area. The Association is responsible and accountable for the management and administration of them, as well as some general maintenance. Twice a year we have a community working-bee to clean up the area in and around the courts. Access is provided by obtaining a key from the Association. The children's playarea contains modern and exciting play equipment that is imaginative and stimulating for children. The feature item installed for the older children is a 'Spida' climbing frame, while for the younger children there is 'The Boat' that has a fort and two slides (one a tube slide) and a number of other activities for the pre-schoolers. There is also a ride-on bucket and a rocking horse on a spring, a swinging pole, a roundabout, and traditional swings. The whole area is covered with special high grade safety matting. The playarea is extremely popular and very well used. It is regarded as the focal point of the community. Included in a section of the playarea, beside the community hall is a 25,000 litre emergency water tank. The tanks are strategically placed, throughtout the city,to provide support to the city's network of reservoirs in the event of a major emergency. Should the city's water supply be disrupted, the community would be able to directly collect drinking water from the tank until the water pipe network is repaired. The tanks are plumbed into the mains so that they are full at all times with potable water. Also, they are sited to enable tanker access for refilling if normal supply is not possible after an emergency. Access to the water is by an attachable distribution manifold which will be kept in the hall along with instructions for its use. The committee of the GVCA and a number of residents have been trained in accessing the water. All emergency services are also trained on accessing the tanks as well. The Mark Avenue fields are situated on the western side of Mark Avenue. The park is split over two levels. Access to the top field is from Mark Avenue while access to the lower park is either via a path past the top park or from the southern end of Buccaneer Place. The top field is used for organised primary school weekend sport. It is also used for sports practices by the community and others for a variety of sports. aircraft, dog obedience, ball skills, jogging and general exercise, and other family related times. Seton Nossiter Park is classified as a recreational reserve protected under Section 17 of the Reserves Act 1977. 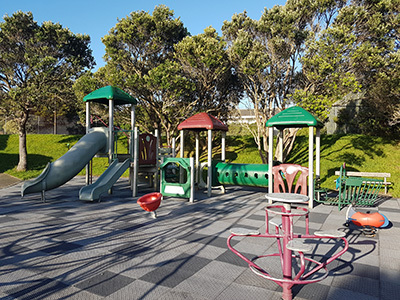 It provides a natural environment for recreational use and enjoyment of the people of Wellington and, in particular, the adjacent communities of Grenada Village, Paparangi, Newlands and Woodridge. These communities have a combined population exceeding 14,000 residents. The park is a very important and significant ecological area with an abundance of wildlife and fresh water stream life. In its wider context, it is part of a wildlife corridor. A remnant titoki-tawa forest is located on the valley floor and the regeneration and propagation of the seedlings currently taking place beneath the trees, is of great importance to its restoration. The Belmont Stream meanders through the park and needs to be crossed five times by foot bridges before reaching the traditional picnic site at the mid-point of the park. The Seton Nossiter Park Working Group and the Woodridge Planters assist the Wellington City Council in maintaining the park. 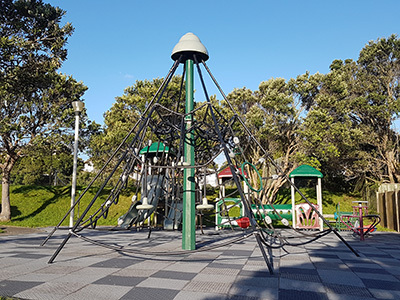 The Seton Nossiter Park Working Group was established in 1995 to ensure there was community representation in the management and welfare of the park and that the park and other park user's interests were identified and recognised. The Working Group and the Wellington City Council have a formal 'Memorandum of Understanding' operating between them. Part of the Group's responsibilities is to assist in the restoration of the park. Since 2007, nearly 20,000 trees have been planted in the park of which nearly 10,000 have been planted by the Seton Nossiter Park Working Group and Woodridge Planters and 10,000 by Wellington City Council. Prior to 2007 approximately 2,000 trees had been planted by the Group. The aim of such plantings is to enhance the natural environment and to contribute to the greening of the local area. The maintenance program involves the controlling of weeds, protecting planting, supporting natural vegetation and the general welfare of the overall park. Directly involving the community creates a sense of pride and makes the area a more attractive and a better place to visit.